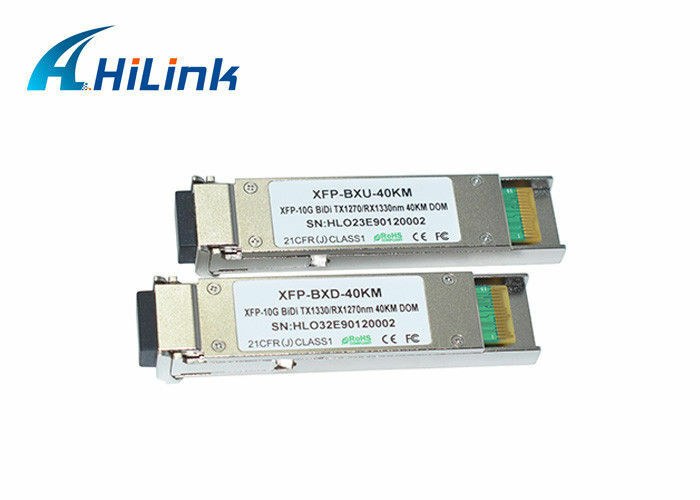 10G BiDi XFP transceivers are designed for bi-directional 10G serial optical data communications such as IEEE 802.3ae 10GBASE-BX by using 1330nm (1270nm) transmitter and 1270nm (1330nm) receiver. It uses a single fiber to transmitter and receive the data rate, which is very cost-effective in optic equipment. Good compatibility: Cisco, Huawei, MikroTik, H3C, HP, Extreme, Foundry, Brocade, D-link, Alcatel, Enterasys, Netgear, Juniper, Ruijie, Zyxel, etc. 1. Contact our sales for more details to confirm your order. 2. Short lead time after confirmation. 3. We deliver goods by international Express. 4. Quick response for customers' feedback and other questions. ›& 3 years warranty(From the date of shipment).